My name is Giorgos Zoukas and I am a second-year PhD student in Science, Technology and Innovation Studies (STIS) at the University of Edinburgh. This guest post is an invitation to the readers and commenters of this blog to participate in my project. VV: I have participated as blogger. For science. I was a little sceptical at first, with all the bad experiences with the everything-is-a-social-construct fundamentalists in the climate “debate”. But Giorgos Zoukas seems to be a good guy and gets science. I even had to try to convince him that science is very social; science is hard to do on your own. A good social surrounding, a working scientific community, increases speed of scientific progress. That science is social does not mean that imperfections lead to completely wrong results for social reasons, that the results are just a social construct. Open thermometer shelter with a single set of louvres. That changes in the measurement conditions can lead to changes in the mean temperature is hopefully known by most people interested in climate change by now. That such changes are likely even more important when it comes to weather variability and extremes is unfortunately less known. The topic is studied much too little given its importance for the study of climatic changes in extremes, which are expected to be responsible for a large part of the impacts from climate change. Thus I was enthusiastic when a Dutch colleague send me a news article on the topic from the homepage of the Belgium weather service, Koninklijk Meteorologisch Instituut (KMI). It describes a comparison of two different measurement set-ups, old and new, made side by side in [[Uccle]], the main office of the KMI. The main difference is the screen used to protect the thermometer from the sun. In the past these were often more open, that makes ventilation better, nowadays they are more closed to reduce (solar and infra red) radiation errors. The more closed screen is a [[Stevenson screen]], invented in the last decades of the 19th century. I had assumed that most countries had switched to Stevenson screens before the 1920s. But I recently learned that Switzerland changed in the 1960s and in Uccle they changed in 1983. Making any change to the measurements is a difficult trade off between improving the system and breaking the homogeneity of the climate record. It would be great to have a historical overview of such historical transitions in the way climate is measured for all countries. I am grateful to the KMI for their permission to republish the story here. The translation, clarifications between square brackets and the related reading section are mine. Closed thermometer screen with a double-louvred walls [Stevenson screen]. In the [Belgian] media one reads regularly that the highest temperature in Belgium is 38.8°C and that it was recorded in Uccle on June 27, 1947. Sometimes, one also mentions that the measurement was conducted in an "open" thermometer screen. On warm days the question typically arises whether this record could be broken. In order to be able to respond to this, it is necessary to take some facts into account that we will summarize below. It is important to know that temperature measurements are affected by various factors, the most important one is the type of the thermometer screen in which the observations are carried out. One wants to measure the air temperature and therefore prevent a warming of the measuring equipment by protecting the instruments from the distorting effects of solar radiation. The type of thermometer screen is particularly important on sunny days and this is reflected in the observations. 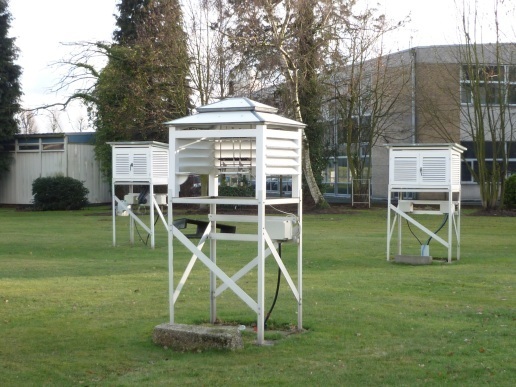 Since 1983, the reference measurements of the weather station Uccle are made in a completely "closed" thermometer screen [a Stevenson screen] with double-louvred walls. Until May 2006, the reference thermometers were mercury thermometers for daily maximums and alcohol thermometers for daily minimums. [A typical combination nowadays because mercury freezes at -38.8°C.] Since June 2006, the temperature measurements are carried out continuously by means of an automatic sensor in the same type of closed cabin. Before 1983, the measurements were carried out in an "open" thermometer screen with only a single set of louvres, which on top of that offered no protection on the north side. Because of the reasons mentioned above, the maximum temperature in this type of shelter were too high, especially during the summer period with intense sunshine. 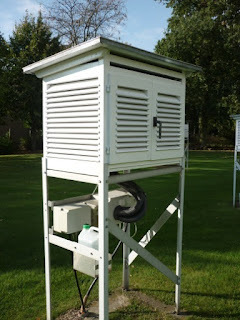 On July 19, 2006, one of the hottest days in Uccle, for example, the reference [Stevenson] screen measured a maximum temperature of 36.2°C compared to 38.2°C in the "open" shelter on the same day. As the air temperature measurements in the closed screen are more relevant, it is advisable to study the temperature records that would be or have been measured in this type of reference screen. Recently we have therefore adjusted the temperature measurements of the open shelter from before 1983, to make them comparable with the values ​​from the closed screen. These adjustments were derived from the comparison between the simultaneous [parallel] observations measured in the two types of screens during a period of 20 years (1986-2005). Today we therefore have two long series of daily temperature extremes (minimum and maximum), beginning in 1901, corresponding to measurements from a closed screen. For the specialists, we note that the daily maximum temperature shown in the synoptic reports of Uccle, usually are up to a few tenths of a degree higher compared with the reference climatological observations that were mentioned previously. This difference can be explained by the time intervals over which the temperature is averaged in order to reduce the influence of atmospheric turbulence. The climatic extremes are calculated over a period of ten minutes, while the synoptic extremes are calculated from values ​​that were averaged over a time span of a minute. In the future, will make these calculation methods the same by applying the climatic procedures always. To study the influence of such transitions in the way the climate is measured using parallel data we have started the Parallel Observations Science Team (ISTI-POST). One of the POST studies is on the transition to Stevenson screens, which is headed by Theo Brandsma. If you have such data please contact us. If you know someone who might, please tell them about POST. Parker, David E., 1994: Effect of changing exposure of thermometers at land stations. International journal of climatology, 14, pp. 1-31, doi: 10.1002/joc.3370140102.